“As we all know, there are 2 types of uterine cancers; type 1 has a great prognosis, but type 2—although very rare—has a very bad prognosis,” said Ghanshyam Yadav, MD, lead study author. Not only are these cancers very aggressive, said Yadav, but the mortality rate is also quite high. Evidence has shown that this is a chemotherapy-resistant disease, demonstrating a significant need for novel, effective targeted treatments. About 30% of uterine serous carcinomas overexpress HER2, added Yadav. Previous research has found that patients with breast cancer who had high levels of HER2 expression were sensitized to PARP inhibitors, regardless of BRCA status. For the olaparib/neratinib study, researchers had conducted cell viability experiments with the agents both alone and in combination through the use of flow cytometry–based assays. They evaluated the synergism of the combination using CompuSyn software. Immunoblotting experiments were also conducted in order to illuminate the mechanism of drug activity. Last, the team used 2 HER2-positive uterine serous carcinoma xenografts to compare the efficacy of the combination with their use as monotherapy. Results showed that the use of olaparib in combination with neratinib was more effective in inhibiting cell growth compared with each agent alone (P <.05). The combination also proved to be highly synergistic in HER2-amplified tumors—ARK-1 and ARK-2—in vitro. However, the combination did not appear to have any impact on ARK-4, which does not have any HER2 amplification. Further, with neratinib, investigators noticed an increase in PAR expression in both uterine serous carcinoma cell lines, which implies that increased PAR activity may be one of the mechanisms responsible for the combination’s synergistic effect. There were also increased levels of HER2 in cells that received single-agent olaparib. Findings from the uterine serous carcinoma xenograft models revealed that the combination led to more potent tumor inhibition and had a more durable effect compared with single-agent olaparib or neratinib, as well as the untreated control (P <.05). 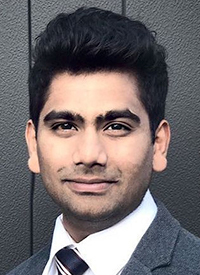 In an interview with OncLive, Yadav, a first-year resident at Baylor College of Medicine, further explored the rationale for this combination, the implications of the findings, and the next steps for this research. OncLive: Could you provide some background on the past research that led up to this study? Yadav: My lab has worked on using TKIs in uterine serous cancers and they were shown to work pretty well. There was a paper done in breast cancer where they saw that once you inhibit PI3K, which is one of the downstream molecules in the pathway, there are also some changes going on in BRCA. [We had previously] thought that maybe these 2 pathways look entirely different. [Neratinib inhibits] the HER/ErbB2 pathway and olaparib inhibits the DNA damage repair pathway. [However, then] we hypothesized that maybe there is some connection between the 2 pathways. That’s why we started investigating this. Then, we found out that once you treat the cell with a PARP inhibitor, it increases HER2 expression on the cell surface, which essentially provides more target to neratinib. We found out that when these cells were treated with neratinib, there was an increase in PAR expression; PAR is basically the active part of PARP. This suggested that there was more DNA damage done. If you take away the PARP, which helps with DNA damage repair, you cause more damage; that's why the combination was very synergistic. After that, we did a mice study and we found that there was a significantly longer survival and statistically significant differences in tumor growth right from day 4 in one of our cell lines. We saw very strong synergism. Could you expand on the combination of olaparib and neratinib?